Beleagured by investigations, the EPA chief continues to unravel protections. Kevin Chmielewski knew when he was out at the Environmental Protection Agency. As he told Democratic members of Congress, it was when the former deputy chief of staff refused to retroactively approve a staff member’s first-class travel from Morocco to the United States. Chmielewski, a 38-year-old former Coast Guard member, was placed on administrative leave without pay, later learning from news reports that he had been fired. A staunch Trump supporter, Chmielewski had tangled with EPA Administrator Scott Pruitt over spending before: He’d previously dissuaded Pruitt from using EPA funds to contract with a private jet company for $100,000 per month. After his firing, Chmielewski turned whistleblower, meeting with congressional Democrats to detail EPA behaviors that he found to be unethical. Scott Pruitt speaking at the 2015 Conservative Political Action Conference (CPAC) in Washington, D.C. The alleged demoting or firing of employees who question Pruitt’s expenses is just one of the controversies embroiling the administrator this spring. Pruitt is the subject of at least 11 ethics investigations into everything from giving raises, one of more than 70 percent, to aides even after the raises were nixed by the White House, to renting a Washington, D.C., condominium from an energy lobbyist’s wife at a steeply discounted rate. Yet even as the scandals pile up, Pruitt continues to roll back pollution regulations that hamper industry agendas, and to weaken the science that supports his agency’s work. During two House budget hearings last month, Pruitt faced questions from lawmakers about ethics violations, including misuse of agency funds, and about his anti-science agenda. Pruitt placed responsibility for his spending decisions on his staff, including the installation of a $43,000 secure phone booth in his office, despite the existence of two other secure communications locations three floors away. Pruitt claimed he was unaware of the cost. He also attributed his first-class domestic travel to his security team, without explaining how first class is safer than coach class on a commercial flight. And according to the Associated Press, the administrator flies coach to Oklahoma when taking personal trips not footed by the EPA. The Environmental Integrity Project, a nonprofit watchdog organization, calculated that Pruitt’s government-funded airfare alone cost more than $167,000 from March 2017 to February 2018. Lawmakers aren’t just concerned about Pruitt’s ethics. They also question the administrator’s anti-science agenda and his skepticism about human-caused climate change, including his assertion that people may benefit from a warming planet. During the hearings, House members criticized the scrubbing of climate change information from the EPA’s website, the agency’s instructions to employees to play up uncertainties around climate change in public presentations, and the erosion of scientific expertise at the EPA through staff changes. Meanwhile, the Sierra Club recently released a trove of internal EPA communications, obtained through a Freedom of Information Act (FOIA) request, that underscores Pruitt’s close ties to the fossil fuel industry. The documents reveal an agency that works with the fossil fuel industry and deregulation lobbyists to develop priorities, scheduling calls, meetings and appearances with organizations such as The Texas Oil and Gas Association and Occidental Petroleum Corporation’s Board of Directors, and with conservative think-tanks such as the Heritage Foundation and the Competitive Enterprise Institute. As criticism of the agency has grown, several high-level EPA staffmembers have abandoned ship. In early April, Samantha K. Dravis, the EPA’s regulatory reform officer tasked with reducing regulations (whose first-class international flight led to Chmielewski’s firing) resigned. Dravis is currently under investigation for allegedly missing months of work while retaining a salary. Then, a week after Pruitt’s House testimonies, press office head Liz Bowman and press deputy John Konkus stepped down, as did Albert “Kell” Kelly, who formerly oversaw the Superfund Site program, and Pasquale “Nino” Perrotta, the head of Pruitt’s security detail. But the swirl of controversies hasn’t halted Pruitt’s push to hobble the EPA. Even as his May congressional hearings unfolded, Pruitt signed a controversial new rule that many researchers and medical professionals worry will hamstring the agency’s ability to use good science in its work, under the guise of increased transparency. The rule requires that the EPA only use data that is publicly available. This could restrict the agency’s access to information, since most raw data belongs to the outside researchers, universities and private companies who conducted the studies, not the EPA. And it repeats the work of the preexisting independent peer-review process of scientific papers. Lawmakers also worry that the policy would expose private healthcare information about patients. In addition, the rule is expensive: EPA staff estimated that a bill introduced by Republican members of Congress with the same objectives would have cost $250 million per year. According to E&E News, Pruit signed his “secret science” rule before the Office of Management and Budget finished reviewing it, a detail that was quickly erased from OMB records. Pruitt has worked since joining the agency to gut the Clean Power Plan, a rule that would reduce greenhouse gas emissions by more than 30 percent in the next decade. And in March 2017, the EPA scrapped a requirement that glider kits — big rigs with new bodies and old diesel engines — meet higher fuel efficiency standards, justifying the decision with industry-backed emissions research contradicted by the EPA’s own internal findings. Pruitt has continued, amid growing ethics scandals, to undo federal policies aimed at fighting climate change. In April, Pruitt announced a rollback of the Obama administration’s rule requiring automakers to increase average fuel economy for vehicles to 54.5 miles per gallon by 2025. Pruitt has taken aim at other pollution regulations, too. In the wake of the 2013 chemical plant explosion in Texas that killed 14 people and injured 200, the Obama administration crafted stricter guidelines for storing hazardous chemicals. Last year, the EPA delayed implementing the rule until 2019. Recently, the EPA proposed weakening regulations of how coal ash, a toxic byproduct from coal-burning power plants, is stored, while also working to weaken regulations of benzene pollution in communities near petroleum refineries. 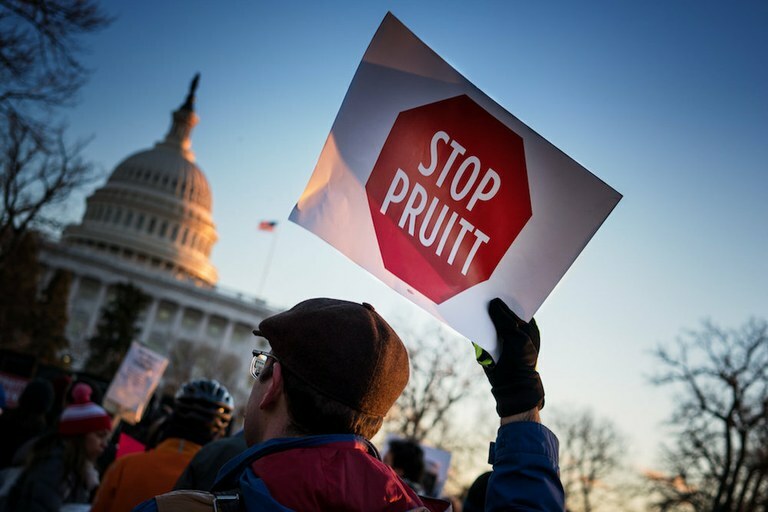 Hundreds of protestors, including current and former EPA employees, marching in Washington, D.C., in protest of Scott Pruitt's nomination to lead the agency in 2017.